Mount Union QB Kevin Burke had 44 touchdown passes and the nation's top passer rating, completing 63 percent of his passes for 3,514 yards. The snowy table was set last week for an upset, for what would have been a surprising but relatively quiet end to Mount Union’s football season in the Div. III national semifinals. North Central (Ill.) was a minute from making its first trip to Alliance a successful one. Blizzard-like conditions rendered kicking games useless, and a miscue on a punt snap had Mount Union playing from behind in the final 10 minutes. There was just one problem for North Central: The machine that is Mount Union doesn’t lose, and to take that a step further, Mount Union rarely punts. 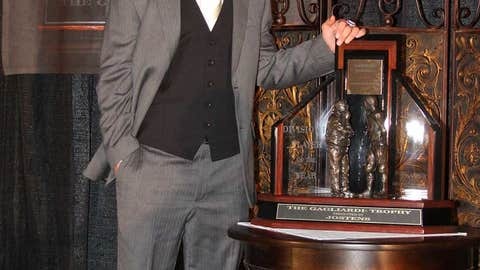 Burke is the winner of the 2013 Gagliardi Trophy, the top individual honor in Div. III football. He is the sixth Mount Union player to receive the honor. Kevin Burke is a big reason for both. Trailing 40-35 with 1:38 left, the junior quarterback from Westlake, Ohio needed all of three plays to get Mount Union into the end zone for the second time in the final five minutes and back to the Stagg Bowl, the Div. III national championship game, for the ninth straight year. A 26-yard touchdown pass to Mike Collichio helped Burke improve to 29-0 as a starter. That win, too, added an exclamation point to what already was decided. At a banquet Wednesday night in Salem, Va., site of the Stagg Bowl, Burke was announced as the winner of the Gagliardi Trophy, the top individual honor in Div. III football. "It’s such a tremendous honor," Burke said. "I’m basically speechless." If there was ever a year Mount Union might have slipped, it could have been this one. The man who built this Div. III empire, Larry Kehres, stepped down as coach last May, leaving the job to his son, Vince. Burke was the only returning starter on offense. He’s been good enough to become Mount Union’s sixth Gagliardi winner, directing Div. III’s most prolific offense (49 points per game) with 44 touchdown passes and the nation’s top passer rating, completing 63 percent of his passes for 3,514 yards. He’s also run for 1,035 yards, a school single-season record for a quarterback. The new Big Man on Campus is listed by Mount Union at 5’11, which is almost as outrageous as the thought of one program making 17 Stagg Bowls in 20 years. 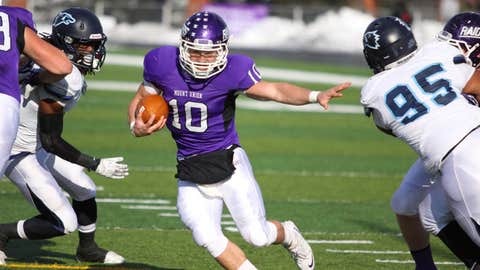 The difference is that Mount Union really has been to 17 Stagg Bowls since 1993, and it’s made its living off of finding players like Burke — players from winning high school programs who love the game and might have been deemed too small or simply were missed by larger college programs. "He’s a Mount Union player all the way," Vince Kehres said. During his senior year at Lakewood St. Edward High School, Burke was recruited by Georgetown University, where his brother, Jeff, played, and by Ohio University. Both saw him as a slot receiver. Both asked him to walk on. His poise is remarkable, he never gets rattled… The way he leads is incredible, that confidence is contagious. "The deciding factor was that Larry Kehres told me he wanted me to play quarterback here," Burke said. In the non-scholarship world of Div. III football, much of Burke’s tuition is covered by academic grants and scholarships. He had a 3.7 GPA in high school and is above a 3.4 as a business management major at Mount, where he lives right next to the practice field. "He’s so smart, but it’s more than that," Vince Kehres said. "Guys follow his lead, and that’s in the fourth quarter and all the way back to last winter. He’s allowed us to do different things and do more offensively. "His poise is remarkable. He never gets rattled. He always believes he’s going to make the next play, no matter how the game has gone or what the circumstance is. That rubs off on his teammates. The way he leads is incredible. That confidence is contagious." At the end of a practice earlier this week, Kehres asked Collichio what he thought when the play for what became the game-winning touchdown pass last week was called. Players and coaches laughed. Burke just shrugged his shoulders. Of course it was six. "In that situation, losing like that in a snowstorm, it’s tempting to let doubt sink in," Burke said. "But not when you play here. Not when you play for the Kehreses. You have a winner’s mentality from the moment you step on campus here. "There’s never a doubt here. You’re expected to win and you know you’re going to win a lot of games. It’s a privilege, not a burden. And it’s something we earn every day." Last week’s win, Burke said, ranks "pretty far up there. It’s a memorable one." But it’s not his best. It doesn’t rank ahead of last year’s Stagg Bowl, a 28-10 win over St. Thomas (Minn.) or the 2010 Ohio Div. I state championship game. Burke’s St. Edward team trailed 21-7 in the third quarter before rallying to beat a Huber Heights Wayne team led by current Ohio State quarterback Braxton Miller. That remains the first and only state title for St. Edward. When Burke enrolled at the school in 2007, at even further from 5’11 than he is now, he quarterbacked the freshman "B" team. He remembers that. How he went from there all the way to holding the Gagliardi Trophy on Wednesday night and those other trophies in between, Burke said, "has been a group effort. The (Gagliardi) is a credit to my parents. Being back in the Stagg Bowl Friday night is about guys doing the little things right, putting in the extra work." "The Gagliardi is incredible, but that’s not the main goal of this week. It’s an amazing accomplishment, but we have another trophy to bring home."